Here at Kotaku, we try to avoid writing stories based on vague statements from developers about things they've got planned in the future, but this is too interesting not to share: turns out Blizzard is constantly thinking about the idea of World of Warcraft II. Strange thought, right? A sequel to an ever-evolving online game that has lasted a decade and still has millions and millions of players? Game Informer asked World of Warcraft game director Tom Chilton about the prospect of a sequel at Gamescom in Germany this week, and he gave a candid answer: "Definitely. It's something we have talked about. It's something we have talked about for ten years. I think that there are a lot of challenges there in seeing how World of Warcraft II relates to World of Warcraft, do they live alongside each other, does one feed into the other, what is that product, etc. These are challenges that have to be figured out before that becomes a reality." Releasing a numbered sequel to the biggest MMORPG in history would be a surprising move for the veteran developers, who plan to launch a fifth expansion to the game this November. 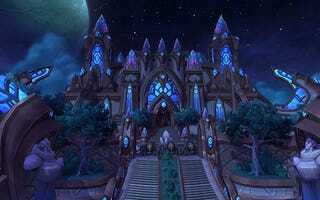 The expansion, Warlords of Draenor, will give an aesthetic overhaul to World of Warcraft's ten-year-old character models, making the game feel more fitting for 2014. At one point, Blizzard was also working on a multiplayer game codenamed Titan, though the company has since announced that they were rebooting work on that MMORPG, and its fate remains up in the air. The thought of a WoW 2 is strange, but not unprecedented. Japanese publisher Square Enix simultaneously maintains Final Fantasy XI and Final Fantasy XIV, which both have active playerbases—though neither comes close to World of Warcraft in both size and cultural dominance.